Killbear – I would never! 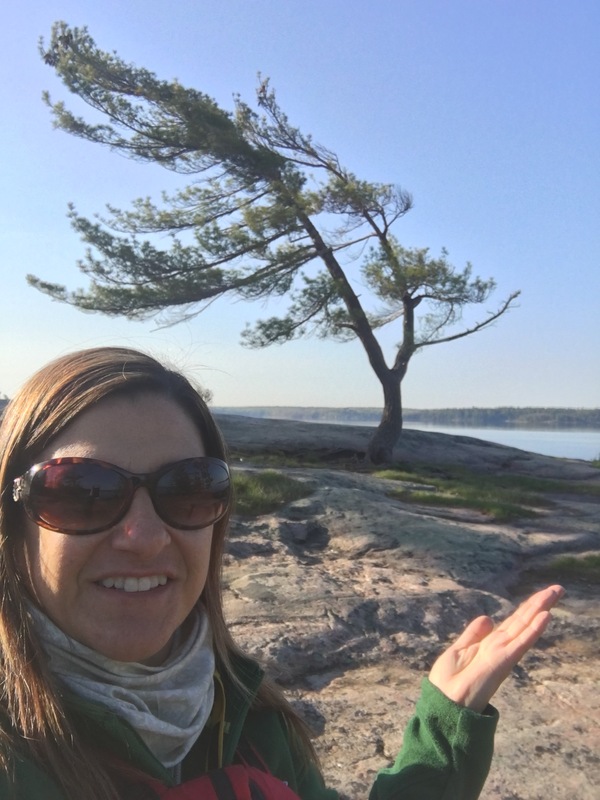 I have always wanted to go to Killbear Provincial Park. Last year I tried out 7 new Ontario Parks and loved almost every one of them. This year, the first on my list to try was Killbear! 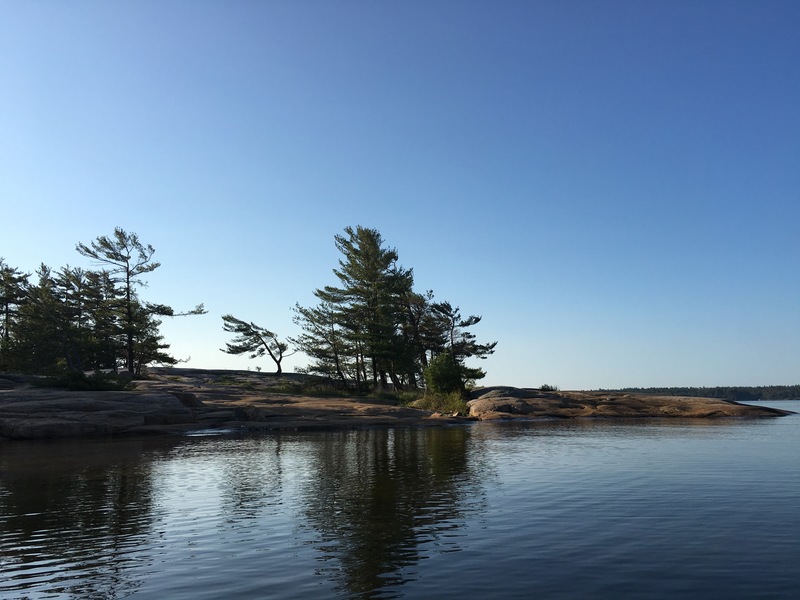 I went to the Ontario Parks Website and checked out the campground and found some sites that looked great! I contacted my friend Steph to see if she was in for doing a May 2-4 trip and she was definately on board. I then realized I would actually be camping at Mew Lake on December 21st when the reservation system would open up for May 21st so I asked Steph to book the adventure and soon we were all set. Then the waiting began. Time seemed like it flew by, from December to May 2-4 I had camped at Mew Lake twice, once in -42 degrees and once on New Years Eve. I’d camped in my homemade tipi a few times, I’d stayed in yurt at Silent Lake , I’d visited a lot of parks hiking, snowshoeing, skating and skiing and saw some cool frozen waterfalls. And then I got a new job and moved to Port Carling so I could be closer to where I like to play! So I guess I did alot but it seemed like it went by quickly. Now it was finally time to discover Killbear! I was stoked! I got off of work at 5 and my friend Steph arrived in Port Carling around 5:30 or so. We were off and arrived at Killbear about an hour later! (it makes me so happy that I am so close to all these awesome places!!). After a small wait in line to register we were on our site and setting up. It was an amazing site, site #330 and I was sooo happy with it! We set up quickly and then put a few steaks on the grill with some asparagus. I am so happy with my Coleman grill I bought a few years ago. It has been on every car camping trip with me and it hasn’t failed me yet. We sat down just in time to see a beautiful sunset while we feasted! After dinner we walked around the campground for a bit and got ourselves familiar with where we were and what was around us. We were also treated to a gorgeous full moon all weekend which made the use of flashlights unnecessary most of the time. It was an excellent treat! I woke up quite early, around 530am and after a quick visit to the nearby comfort station, I grabbed my lifejacket and paddle and jumped in my kayak to check out the water. Our site had a small trail that took you right to the beach so it was very convenient for people like me. The water was incredibly calm and I was in awe that there wasn’t even the slightest ripple on it. I mean, this is Georgian Bay and it is a huge body of water. For it to be this still was very rare and I took full advantage. After a few hours I got hungry and headed back to the site to get some breakfast going and get the day started right! We ate and then headed over to The Detour Store, the outfitters store nearby to rent a kayak for Steph. They were very nice, had reasonable prices and quickly got the kayak on top of my car and we were on our way! When we got back we packed up some stuff and decided to go for a hike. We walked from our site to the Killbear Recreational trail also known as the bicycle trail. It was fairly easy and we just walked along enjoying the fresh air. After a bit, we came across the Visitors Centre. Many people had recommended I stop in there so I figured we should take their advice. It was definitely good advice! The visitor centre is very cool indeed and it reminded me a lot of the one in Algonquin. It wasn’t quite as big of course, but it was still full of information and great displays and I definitely recommend you stop in for a visit if you are at, or near, the park! There were lots of displays that gave information of the rocks here and how they came to be and I found it fascinating. I love rocks, especially the ones in the north! After we’d checked everything out we decided to follow a suggestion we saw in the Killbear tabloid last night, hiking the rocks on the shoreline from here to the next campground loop. It was absolutely stunning and we even made a new friend along the way! Isn’t he cute? He slithered away quickly and I could only get a picture of his body, but I still thought it was cool. It was quite beautiful and I could’ve hung out there the whole day! Eventually, we made it back to the beach and walked up the campground road and back to the bicycle trail. As we’d been gone for hours and hours and didn’t want to hike farther out, we decided to head back to the campsite and enjoy the beautiful weather on our lovely beach. By the time we returned though, it wasn’t sunny and hot anymore so after a lil nap we made some dinner which was delicious! Salmon with a crab and cream cheese filling made by the people at Foodland (lol) accompanied by snow peas and potato salad. YUM! After a super yummy meal, Steph and I jumped in the kayaks and went for a spin around the lake and waited for the sun to set. It was absolutely breathtaking! When we got back we made a fire and relaxed for a bit before bed. We were both exhausted and ready for a nice long sleep! I woke up early again the next morning. My body just didn’t want to be asleep with so much beauty surrounding me, so I got up and went for a morning paddle. I was later than the day before however, so the water was not nearly as calm, but still pretty good for the time of day and size of the bay. LOL! I headed back to the site and Steph and I had a great breakfast and then planned our day. We would paddle to the lighthouse and back, then relax on the beach for a bit and maybe hike one of the trails after if we could manage it. We packed up our food and put everything away, brought some snacks and water with us and headed out to paddle the bay! The weather was perfect! Not too hot, not too cold and not too windy. It made for a terrific late morning paddle. Once we passed the lighthouse though, and came around the point, all of that changed quickly. The current was strong and the wind was biting and we quickly turned around and headed back from where we’d come. Going back around the point of the lighthouse (which was the area blocking the wind) was a small inlet and a beach. Steph and I decided to stop there for a break and a snack before we paddled back to our site. The paddle back to our site was much quicker as we had the current with us and the wind at our backs. When we returned we put on our swim suits and headed to the beach for some relaxing time in the sun. I read the park tabloid for a bit and just enjoyed finally lying in the sun after all these months. It was heavenly! After a few hours the sun pooched us so we headed back up to our site for a late lunch. We packed up our backpacks and headed out to Lookout Point Trail on a new adventure! Napping almost won this round, but we overcame it!!!! Lookout Point Trail is a 3.5 km loop trail that is rated as moderate. It’s a beautiful trail and I enjoyed it quite a bit. The terrain was varied, sometimes you were on a boardwalk, sometimes walking on rock and sometimes in the mud or pine needle type mulch. I liked all the changes. There were also a lot of different types of plants and I was surprised the fiddleheads were still here as they had all opened up in Port Carling last week. It was amazing how much different things could be only one hour north. Steph was in front of me hiking along when she saw this giant bird crossing the trail. He was a bit camera shy so I only got a picture from far away but I think it was a grouse? Anyone know for sure? We made it to the lookout in no time at all and it was stunning! We sat for a moment and had a snack and then headed back out on the trail and back to our site! We were supposed to have roasted hot dogs on the campfire but we had noticed a fish and chips stand just outside the park and thought it would be a great idea to be treated to dinner and not have to worry about cooking and dishes etc etc, so we changed and headed out to get some grub and to drop off Stephs kayak…. and… maybe get some ice cream? WTH? The name of the place we stopped is called Perks and it is a wonderful place to get some delicious local fish. The breading was excellent, not too thick and not too greasy and the fries were fresh cut and tasty. We were given a generous kids portion as we intended to have ice cream later. The owner told us he’d been a fisherman his whole life and he was proud of the food he served. He also gave us a lot of information about the area and some tips on good places to paddle nearby that I was very grateful for. We were thrilled we’d decided to go there and I will definitely return when I am back in the area! After our dinner we went to the Detour store to do a little shirt shopping and get an ice cream cone! It was equally delicious and we enjoyed it all the way back to our campsite. When we returned, we had a short fire and were both far too tired from all our adventuring to stay up long, so we headed to bed, sad it was almost time to go. I woke up just as the sun was rising and jumped in my kayak to go for one last Killbear paddle. It was truly gorgeous here. Plus, I still had to stop and get a shot of the most photographed tree in Ontario. 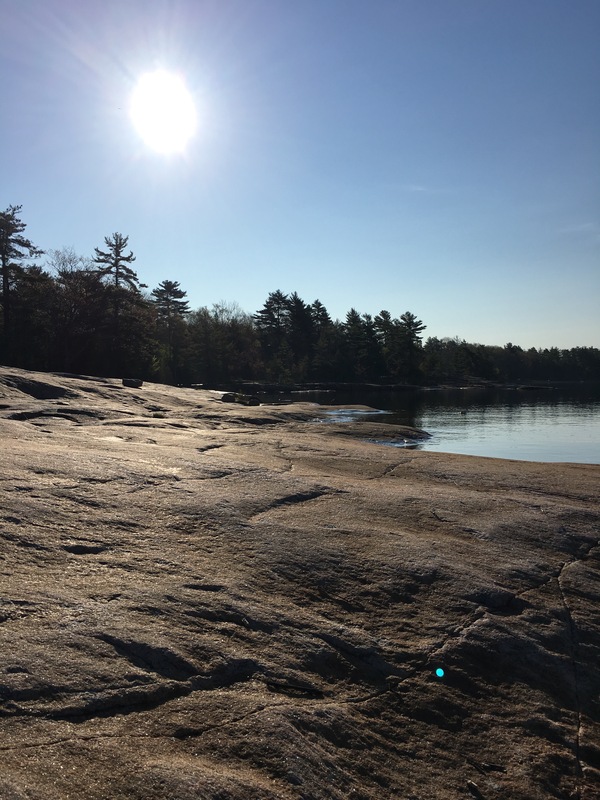 The rock it sits on is known as sunset rock and it is where everyone goes to sit and watch the sunset at Killbear. As a little test I posted a photo of the famous tree on the Camping Ontario Facebook page and it was a quick and easy answer to my question of “who knows where this tree is located?” There were many replies and lots of them were huge fans of it and the park, which made me smile, because I too, was now also a Killbear fan! I slowly headed back to camp, not in any rush to leave this beautiful place. Sooner or later though, you have to accept that it’s time to go, so we made a tasty breakfast and then packed up the site. Chippy was looking for some treats but we didn’t give in to his cuteness. Soon our site was bare again and it was just a bit after ten so we decided to do the short trail we hadnt gotten to earlier. The trail was called Twin Points Trail and it was my favourite trail of the weekend. The trail started out along the water and then turned into the forest but a good portion of it was flat rock as pictured above. There were cute little wild flowers growing between the rocks and the trail was very scenic and pretty… and more fiddleheads of course! When the trail came out to the water again, it was simply stunning. Everywhere you could see, there was rock, except a few places where there were some cute little beaches in between. I was in love, as this is one of my favourite types of landscapes and I wish I was able to spend more time here. Thankfully, I live just an hour away, so I can come and visit for the day, or even just a few hours if I chose to. I feel so incredibly lucky to be able to do that and more and more it becomes evident that this area is where I belong. After spending a few minutes enjoying the view, we ducked back into the forest and onto a boardwalk that eventually led us back to the parking lot. First we went past a somewhat swampy area that was full of geese, ducks and a few other types of birds. I could not wait to return! We got into the car and headed back to Port Carling, where Steph would take off to Niagara and I would have the whole day to continue exploring. What would I do???? I guess you will have to return and see where I spent the rest of the day! 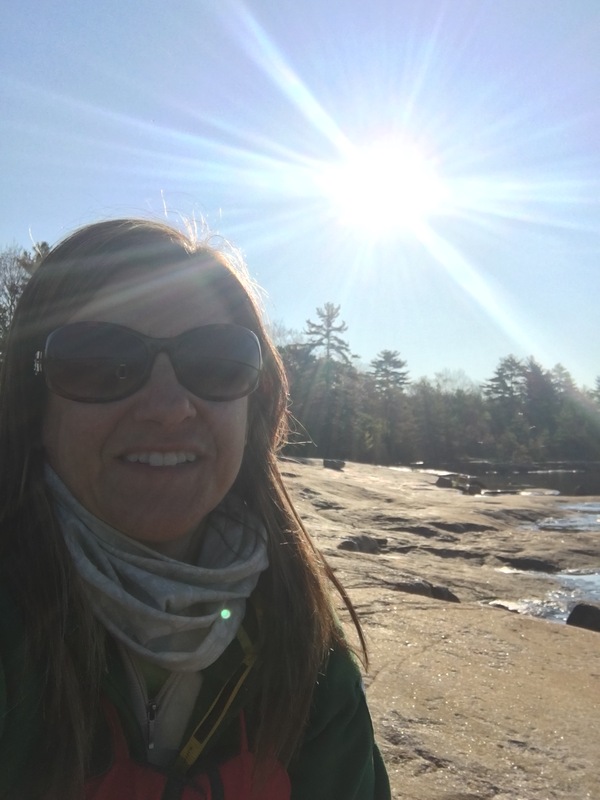 My time at Killbear was wonderful. I did notice that many of the campsites were not extremely private, but I also noticed that no one seemed to care. Everyone there was there to enjoy the natural beauty of the park and it was so big you really could go off alone if you chose to, or adventure in the good company of other outdoor enthusiasts who were out performing the same activities as you were. This is one of my favourite areas of Ontario (so far!) and I am delighted to say I will be adventuring a lot here this summer! From paddling and hiking adventures in Muskoka, to a Wilderness Navigation Course at Frontenac Provincial Park and spending the weekend checking out the Harmony Outdoor Inn while obtaining my Paddle Canada Sea Kayak Level 1 Skills certificate with the Ontario Sea Kayak Centre, there is something coming up here for everyone! I hope you come back and check it out! Thanks so much Dino! I’m so glad you liked it! Happy exploring! Another great write-up Christina, and beautiful pictures! Thanks so much for checking it out Shawn! Hope your trip was awesome ! Nothing beats those Ontario sunsets! Fantastic shots! I was there last Labour day. The sunsets up at the point are fantastic. Also watch out for the bears, I’ve always run into atleast one any time Ive been there. Nice report, Christina! And yes, that bird was a ruffed grouse, Bonasa umbellus. I love Killbear, especially the Granite Saddle loop. Nice sand beaches facing two directions, including the sunset. I have often seen bears there (sign at entrance; “Bears active in park”), and also many raccoons on nighttime food forays. That snake friend you encountered appears to be a Massassauga Rattlesnake. Good to be aware that they are in the area, so you don’t inadvertently stick your hand where you can’t see when climbing the many PreCambrian rock formations. Their bite isn’t usually fatal, but will change the whole dynamic of your experience. Thanks so much for checking out the post Rob and for all the great information. Happy camping !!! We took our children to KillBear years ago, they loved it. It is a very family friendly park. Yes, we did and yes, they are sooo delicious. I could eat them everyday! I am behind as well so no worries! Been hectic running two blogs and with all the new clients. But I’ll catch up too bit by bit! Granite saddle! Is where you need to get a spot and walk down to the high rocks and see the sunset or moonset if you can catch one. And find the hidden private beaches for a good swim. Thanks Jacob! 🙂 Happy Camping!